PT Astra International Tbk - Astra International known as "Astra Group" is one of the largest diversified business groups in Indonesia. Together with its 200 subsidiary companies, joint ventures and associates, and served by more than 200,000 employees, Astra Group has strong business competencies in 7 (seven) business pillars; automotive, financial services, heavy equipment and mining, agribusiness, infrastructure and logistics, information technology, and property. 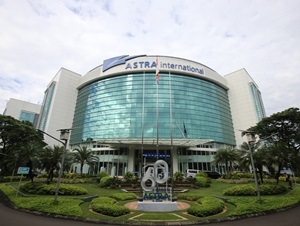 Astra Group was first established in 1957 and initially started as a small trading company named PT Astra International Inc. Later in 1990, the Company conducted its Initial Public Offering (IPO) and the name of the Company changed to PT Astra International Tbk. Astra Group was listed on the Indonesia Stock Exchange (IDX) under reference code ASII. At present, Astra Group is majority owned by Jardine Cycle & Carriage of Singapore (JC&C) which in turn is majority owned by the Jardine Matheson Group. As of December 2016, Jardine Cycle & Carriage of Singapore has a 50.11% interest in Astra Group. Other remaining interest in Astra Group was owned by general public and investors. Hold education at least Bachelor/Master Degree (S1/S2) from any major. The candidates with 1 year of experiences in customer experience, or related field highly preferable. Fresh graduate are welcome. Customer oriented and ability to adapt or respond to different types of characters. Demonstrated good interpersonal and analytical thinking skills. Dynamic and able to work in a team. Have a can-do attitude at work. Willing to handle multiple tasks simultaneously. Hold education at least Bachelor/Master Degree (S1/S2) from Business Management, Marketing, Information Systems, or any related major. The candidates with 2 years of experiences in customer retention and maintenance, or related field highly preferable. Fresh graduate are welcome. Hold education at least Bachelor/Master Degree (S1/S2) from Economics, Business Management, or any related major. The candidates with 1 year of experience in related field highly preferable. Fresh graduate are welcome. Have digital marketing technical skills will be beneficial. The candidates with 1 year of experience in product analytics, financial analytics, product development, financial management or related field highly preferable. Fresh graduate are welcome. Have basic market research skill will be beneficial. Excellent writing skills to prepare detailed report. Hold education at least Bachelor/Master Degree (S1/S2) from Business, Industrial Engineering, Marketing, or any related major. The candidates with 1 year of experience in digital product development or related field highly preferable. Fresh graduate are welcome. Have basic computer literacy skill. Hold education at least Bachelor/Master Degree (S1/S2) from Economics, Industrial Engineering, Statistics. The candidates with 1 year of experience in risk control/management or related field highly preferable. Fresh graduate are welcome. Have auditing, basic accounting/finance, statistics skills will be beneficial. JobsCDC.com now available on android device. Download now on Google Play here. Please be aware of recruitment fraud. The entire stage of this selection process is free of charge. PT Astra International Tbk - S1, S2 Fresh Graduate, Experienced Staff Astra Group November 2018 will never ask for fees or upfront payments for any purposes during the recruitment process such as transportation and accommodation.